Until recently, every time we considered a trip to the Far East, we deferred because of distance, time commitment, and expense. Last spring, however, a promotion from Malaysia Airlines—introducing service from Newark to Malaysia via Dubai—landed on my desk. 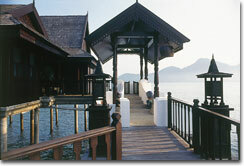 The $750 (1998) package included the choice of a stay in Kuala Lumpur or an internal flight and four-night stay in one of Malaysia's many resort areas. How could we resist? The dollar was strong against the ringgit, and, in spite of its financial difficulties, Malaysia is politically stable and safe. To add to our comfort level, English is widely spoken there. Deciding where to go and what to do was difficult. Malaysia offers a wealth of possibilities—some of the world's best snorkeling and diving, ancient rain forests, and national parks, as well as beach resorts of every description.